← What’s going on in Walsall Social Services? Are you interested in wildlife, or maybe have a budding David Attenborough or Chris Packham in the family? Want to bring out your inner Bill Oddie or Simon King? If so, Brownhills Common is the place to be this weekend, Friday 16th and Saturday 17th May 2014. The excellent and lovely Walsall Wildlife crew will be out carrying out their annual BioBlitz project, which this year focusses on our very own commons and heaths around Brownhills. The Countryside Rangers – as well as a whole host of other knowledgable and approachable experts – will be on hand to show you what lives in the air above, on and beneath the Commons and open spaces we all love. Everything from Bats to birds, deer to damselflies, moths to mammals – there will be something to engage everyone, from young to old. Brownhills Common hosts a huge range of life from the small and squeaky to the creepy and crawly – and these folk will show you what it is, where to find it and most importantly, how to respect and support it. Basecamp will be at Holland Park Car Park, just of The Parade, Brownhills. 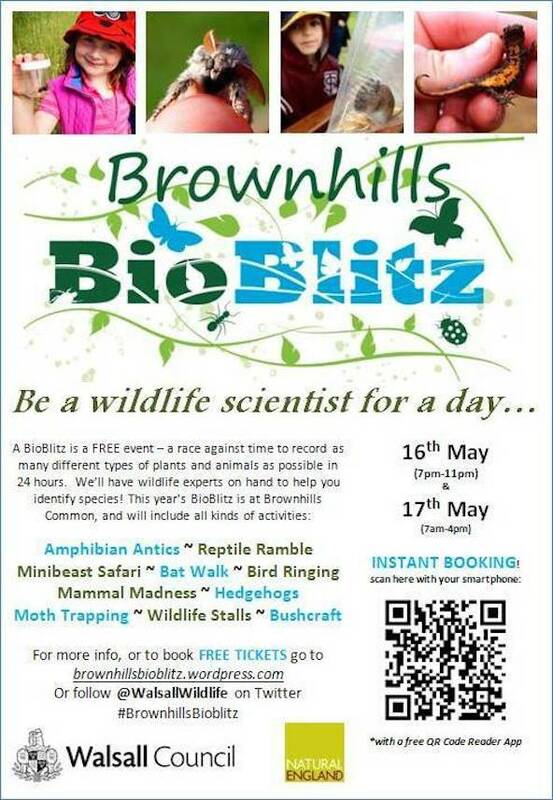 The event is free, but you’re encouraged to book tickets on the Brownhills Bioblitz site here, or check out Walsall Wildlife on Twitter and Facebook. Bird Ringing – Mini Mammals – Hedgehogs – Moth Trapping –And much, much more. Join us on the Friday evening from 7pm-11pm, or all day on the Saturday from 7am-4pm, or both! Its totally free and a chance for a real wild encounter! The event runs from 7pm-11pm on Friday the 16th May and from 7am-4pm on Saturday the 17th May. Take a look at the Activities Page for details of times of the various activities. If you want to see mammals, reptiles and amphibians, you’re best bet is to come early on the Saturday as from 7am-10am we are checking all the traps we set the night before. If it’s bug-hunting you’re interested in, drop in anytime from 10am in the morning onwards. There will be bird ringing and hedgehogs from 10am onwards at basecamp. Basecamp: Basecamp will be located in the holland park car park. This is where you need to meet for all of our activities, and we’ll also have lots of stalls and activities at basecamp! Toilets: The toilets at Holland Park will be available for use. Dogs: Dogs are welcome at the event, but you are asked (as always) to clean up after your dog, and to ensure that dogs are well-behaved and under control. Dogs will not be allowed in the area where the bird ringing and hedgehog stalls are taking place. Getting there by Car: From Wednesfield, Bloxwich and Pelsall, take the A4124 east towards Brownhills until you get to the Brownhills Roundabout (with the giant miner statue) and take the first exit, then immediately left onto the Parade. Holland Park car park is on the right hand side, where you will be guided to the parking area. From Lichfield, Cannock, Norton Canes, take the A5 Watling Street and then head south onto the Parade, where you’ll find the Holland Park car park entrance on the left hand side, where you will be guided to the parking area. From Shire Oak and Aldridge, take the A452 through Brownhills to the Miner Roundabout and take the third exit, then immediately turn left onto the parade. Holland Park car park is on the right hand side, where you will be guided to the parking area. Getting there by Bus: The number 33 (Cannock-Walsall), 56 (Birmingham-Brownhills West), 935a (Birmingham – Brownhills West) and 32 (Hednesford – Rugeley) all go down the Parade. Numbers 33a (Walsall-Brownhills West) and 10 (Burntwood-Walsall) and 10a (Walsall-Brownhills West) go down the Chester Road North (Alight at the Parade). Why not come and meet the neighbours? 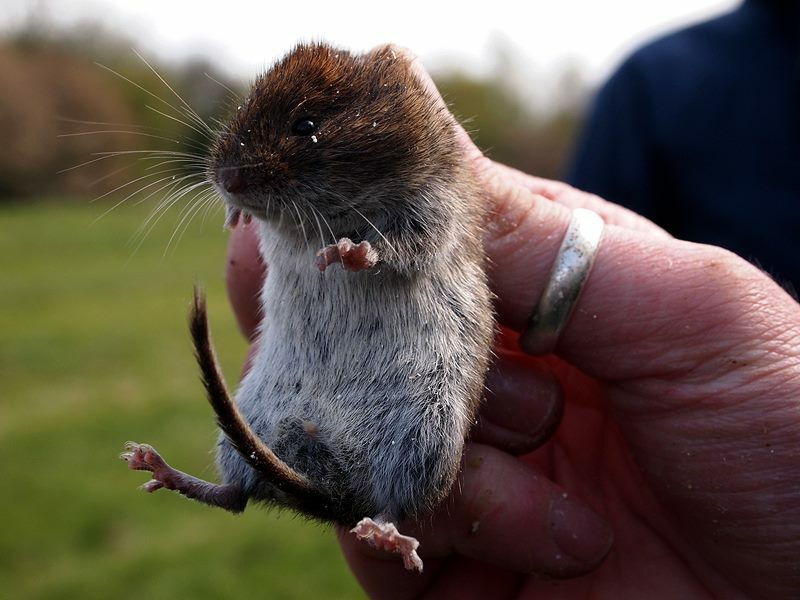 Like this handsome and healthy vole – image from Walsall Wildlife. 7pm – 7.45pm: Amphibian Antics – Set bottle traps to catch newts overnight! 8pm – 8:45pm: Mini Mammal Mayhem – Set & bait live mammal traps! 7am – 7.45am: Amphibian Antics – Check bottle traps for newts! 8am – 8:45am: Mini Mammals – Meet some mini mammals! 9am – 9.45am: Reptile Ramble – search for lizards! 12pm-1pm Big Picnic – bring a packed lunch! This entry was posted in Brownhills stuff, cycling, Environment, Events, Followups, Fun stuff to see and do, Interesting photos, Just plain daft, Local Blogs, Local media, News, Reader enquiries, Shared media, Social Media, Spotted whilst browsing the web, Walsall community, Walsall Council, Wildlife and tagged 16, 17, 2014, Bio, Bioblitz, Blitz, Brownhills, Brownhills common, Chasewater SSSI, Children, Common, conservation, Countryside Services, Cycle rides, cycling, Events, Facebook, free, Greenspace, Heathland, Kevin Clements, kids, local blogs, Local History, Management, May, Morgan Bowers, Natural England, Nature, Special, Things to do, tickets, Twitter, Walsal Wildlife, Walsall, Walsall Council. Bookmark the permalink. We have been as family tonight. It was a brilliant evening. Well organised and great fun.